The Medjugorje.pro and webMedjugorje.com with 2Checkout.com, Inc. ( 2Checkout.com, Inc. is an authorized retailer of goods and services provided by Medjugorje.pro & Studio Leonardo. ) accept Visa, MasterCard, JCB, Diners, American express, Discovery and PayPal. All information you submit is secure (https: protocol) . The Medjugorje.pro and 2checkout.com, use SSL (Secure Socket Layer) to encrypt all of your ordering information so that no part of your order can be read during ordering. We use the latest and most sophisticated encryption methods to shield all credit card information. Your order transmissions are fully encrypted. Please be assured that we do not sell or share our customer information with anyone, for any reason. The Medjugorje.pro , webMedjugorje.com and Studio Leonardo is not responsible for any typographical errors that may appear on our online web site. We can not take responsibility for UPS or postal delays beyond our control. 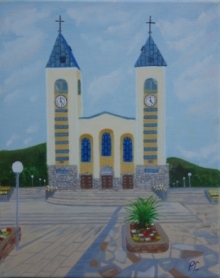 The Medjugorje.pro , webMedjugorje.com and Studio Leonardo respects the privacy of our subscribers, pilgrims, customers, visitors to our web site, and those who e-mail us. The Medjugorje.pro , webMedjugorje.com and Studio Leonardo never sells or shares personal details (including e-mail addresses) with third parties.